Why Is The Suppository Still Supported By The Hierarchy? I was in Westminster Cathedral this week, and what do you think was on sale? Now, one might reasonably expect any magazine openly on sale within the confines of the Cathedral to be endorsed by the Cathedral authorities, no? 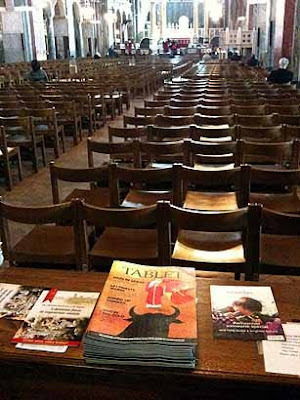 The presence in the Cathedral of this magazine, which is infamous for its attacks on the Holy Father and for its dissent from the Magisterium, is an utter disgrace. 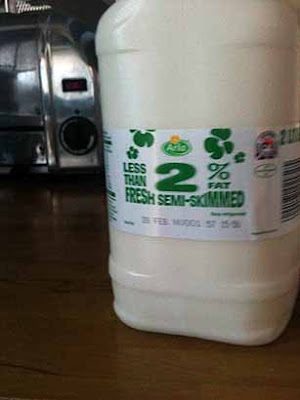 ...unless, of course, you want to buy milk which is "less than fresh" ! Today we were breaking down protein to produce ammonia. As I was handing out the protein samples, I said to the class, "The protein we're using is egg albumin... basically it's egg whites." One of the duties to which the Church encourages us to pay more attention during the season of Lent is that of almsgiving. Finding suitable charities to support (ones that don't fund research into embryo experimentation, contraception or abortion, for example) can be difficult. The SPUC charities page is an invaluable resource. However, closer to home, there is a totally pro-life charity which is in need of a bit more support. 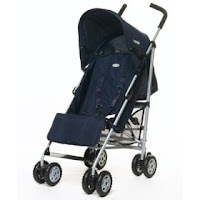 The wonderful Sisters of the Gospel of Life are appealing for help with buggies, cots, moses baskets and baby baths, which they then give to mothers who, without such practical support, might have ended up aborting their babies, simply because they couldn't see any way to manage. Now, the Sisters are actually asking for any second-hand items which are going spare. But this is only really practical if you happen to live in the Glasgow area. Alternatively, the Sisters have a PayPal donation button on their sidebar. There are lots of price comparison websites out there: they work by getting commission on each product sold through their sites. A new website has just started up. Catholic Values promises to donate at least 90% of the commission to UK charities which support the dignity of human life from conception to natural death. The venture works with Beatthatquote.com to generate the commission, and is a non-profitmaking organisation. So, simply by using Catholic Values to find the cheapest quotes for car insurance, home insurance, loans, mortgages, credit cards and so on, charities which value human life will get the commission, and at no extra cost to you, the buyer. I think this is an excellent venture, and wish it every success. Pop over to the website and see what they have to offer. Saturday 6th March marked the launch of www.catholicvalues.co.uk – a price comparison website with a difference. The difference being that all profits net of running costs made through the website are to be donated to UK charities who support the dignity of human life from conception to natural death. The general public have become accustomed to using price comparison websites. As consumers have sought to attain greater discounts on motor insurance, other forms of financial services and their utility bills, commission levels generated by the websites having grown to an annual figure of over £450 million. Catholic Values Ltd, the company behind the national initiative hope to take a share of this considerable sum by persuading the UK’s Catholic population and other likeminded individuals to use their financial power to help causes that value the dignity of life. Because the organisation is non-profit making, at least 90% of the commission generated will be passed on to these causes. The company plans to distribute funds on a quarterly basis and has already had meetings with the church hierarchy and contacted leading pro-life organisations to inform them of their plans. Martin Foley, former CEO of Life and Luke Parsons, long-time pro-life campaigner and barrister, will sit with Di Falco as Directors of the venture. Catholic Values’ partner in this venture is beathatquote.com, an established company in the price comparison field. As this Saturday was the first in the month, we had our usual visiting schola along to sing the Missa Cantata at Our Lady of the Rosary. As it was also the anniversary of Fr. 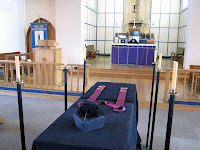 Adolph Koch, first Parish Priest of Blackfen, it was decided to celebrate a Requiem Mass for him, with Absolutions at the catafalque. The Mass was very moving: I definitely want my funeral Mass to be in the Extraordinary Form, unbleached candles and all. I took loads of photos with my snazzy digital camera - I didn't even try to use my mobile phone camera, as the quality of camera on the iPhone is really pants! I then arranged them all into a slide show which I set to music - Mass XVIII from Nick Gale's educational CD, as it so happens... he told me I could use bits of it for my videos, and you can order the CD from this website.